Just a couple of dudes hanging out at the Greek Festival. This is one of the first things Virginia Gov. Terry McAuliffe says to me as he gets out of his SUV at the back entrance of the Richmond Greek Festival, surrounded by aides and men with ear pieces, men who I presume would snap one of my arms off if I even looked at the governor wrong. 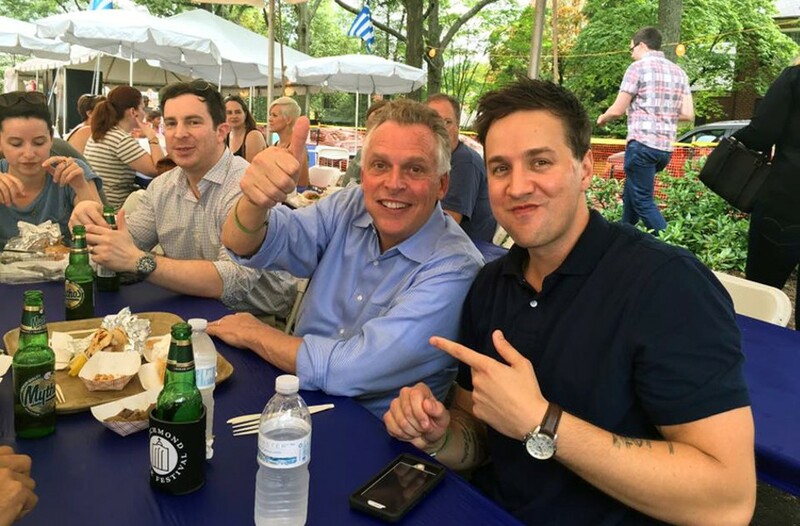 True to form, McAuliffe likes to have a few cold ones, and I immediately buy three Greek beers — one for him, his aide and me. The multimillionaire governor never returns the favor, but I figure now I can hit him up for tickets to a fancy ball or a grant of clemency somewhere down the road. The Richmond Greek Festival, also true to form, is packed to the gills. The line for gyros has at least 200 people in it. But, as in years past, the food is spectacular and no one seems too put out by the wait. When you see restaurateur Johnny Giavos sweating it out with the other cooks, you can usually be assured of a great meal. Luckily for me, now that I’m part of the governor’s entourage, I don’t have to wait in line. Trays and trays of everything the festival offers are brought to a waiting table. Getting to that table is another story. From his arrival at the back entrance of the festival to the front entrance where our table is located — a journey of maybe 200 yards — takes about 45 minutes to traverse. Say what you want about his politics and friends, but don’t say that McAuliffe isn’t a genuinely charming individual. He shakes so many hands, poses for so many pictures and has so many in-depth conversations with people in those 45 minutes. And remember, this guy isn’t even running for anything. I think he just likes to hear from Virginians. He wasn’t the only politician there either. We happen to run into his former Secretary of the Commonwealth and current Richmond mayoral candidate Levar Stoney shaking hands and kissing babies. Former city councilman and proud Greek Bill Pantele is also there volunteering and brings heaps of food for the governor and his cronies, a crew of which I am now part. The real star of the show is the food — sorry, Terry. The dolmades, souvlaki and spanakopita are highlights. McAuliffe also requests some of the new-to-the-festival lamb sausage — also excellent. It’s surreal sitting next to the governor, drinking beer and eating food. A cool experience to be sure. And the Richmond Greek Festival was on point as always, although I do recommend going with a famous politician. The first round of beer was $15 out of my pocket, but skipping the food line was priceless.